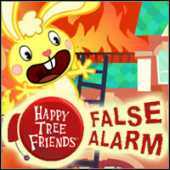 Disaster has struck the Happy Tree Friends, based on the popular Flash animated series. The internet video phenomenon about cute, cuddly, giggly, and adorable animals who are often gruesomely shredded and skewered in ultra-violent displays of comedic anarchy. Earthquakes, fires, and other catastrophes have trapped the beloved friends who now must be rescued. In a unique twist to the action genre, guide the rescue squad of Flippy, Handy, and Lumpy into dangerous situations using unique abilities in a dynamic reactive environment to save as many trapped Happy Tree Friends as possible. Cute, cuddly, and horribly wrong, the game is filled with unexpected situations and outrageous outcomes. For the first time in 3D, play as the rescue squad of Flippy, Handy, and Lumpy to save other Happy Tree Friends such as Cuddles, Toothy and Flaky from life-threatening disasters. In an unique twist to the action genre, use physics-based reactive environments and problem-solving elements to control a rescue squad with unique abilities such as hurling concrete, spraying water, or throwing nitroglycerin to augment the dynamic 3D environments creating a variety of unpredictable outcomes. Disaster levels were made exclusively for the game by SEGA and the creative minds behind Happy Tree Friends who have teamed up to create 10 original and engaging disaster scenarios such as the Mine Shaft, Candy Factory, and Museum. The gameplay is true to the franchise; experience the non-stop hilarious action Happy Tree Friends-style where their accident prone universe means destruction and mayhem are inevitable.